Murchison Falls National Park is the Largest National Park in Uganda and it’s found in the northern part of the country. In this article we talk about some of the accommodation options for you to pick from when going on a safari in Uganda. On a visit in this park, you will have an opportunity to enjoy game drives with sighs of some of the big view, enjoy a boat ride and explore the powerful Murchison Falls on River Nile the longest in the world. This new Five Star Accommodation is found inside Murchison Falls National Park, and it is among the best safari lodges across Uganda. Located on the banks of River Nile, the lodge offers breathtaking views of wildlife like hippos in the river, birds on the banks and the sound of water hitting upon the rapids. The lodge has 36 beautiful guestrooms, a presidential cottage, 21 luxury tents and 4 suites. Each of these self contained with a private balcony that offers sweeping views of the surrounding wilderness. Some of the lodge Amenities you will enjoy here include: a Telescope for star-gazing, Restaurant, bar, swimming pool, children´s play area, Gift shop and 24/7 electricity supplied by a Generator. This eco-friendly luxury lodge is a favorite to many and it’s located in a papyrus forest along the banks of River Nile, in Murchison Falls National Park. It brings its guests closer to Mother Nature thanks to its natural setting. During your stay you will enjoy views of overhanging weaver bird nests, hippos in the river and the playful vervet monkeys jumping from one branch to another. It has 10 guestrooms including five luxury tents plus five wooden chalets each having en-suite bathroom and toilet facilities with flowing hot and cold water. They also have a private veranda each on which you can enjoy and early coffee or cold sundowner. Although it was opened in 1954, the Luxury Paraa Safari Lodge situated in Murchison Falls National Park seats along the river banks of the Nile. The lodge is found in very beautiful gardens, and these matched with the god décor will definitely impress you. The lodge has a total of 54 rooms with a balcony and private toilet & bathroom with running cold &hot water plus a fun. The Suites each have air conditioning, wide windows and a mini bar.The Queen’s Cottage contains a mini bar, air conditioning, living/dining room, bath, king-sized master bedroom, a twin room and each of these has its own bathrooms. Located on the southern river banks of the Nile offers nice mid-range accommodation. Its outside the park but very close to the Paraa Ferry. At this lodge you will be fascinated by the view of different animals such a elephants and buffaloes grazing on the opposite side of the river. It offers accommodation in thatched cottages, safari tents and also has a camping site for those that wish to pitch their own tents. The spacious cottages each has a veranda on which you can enjoy some game views or even unwind in the evening after your day’s adventure. This is the sole budget accommodation facility found within Murchison Falls National Park on the southern banks of the Nile a few meters from the docking area of the Paraa ferry. They have a nice restaurant that offers various delicious dishes, a bonfire lit in the evening perfect for you to unwind and enjoy a beer. It offers a number of bandas each with a mosquito net, electric lights, fan, linen plus towels. 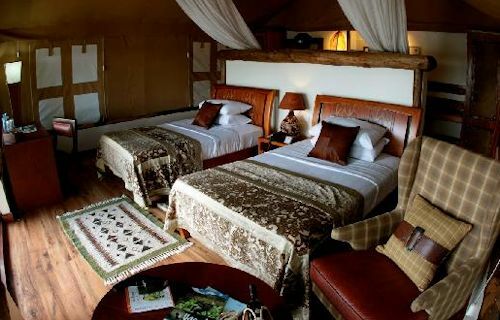 Also their safari tents are furnished, supplied with linen, paraffin lamps and treated with good mosquito repellent. This unique lodge blends the country’s past with the present. The beautiful architecture was done in the Moroccan Kasbah way. This is a unique eco-lodge set in a natural green environment to bring visitors close to Mother Nature. They also have furnished tents that are spacious and very clean. Each of these is fitted with clean linen, bedside lamp, towels and mosquito net. They also have power points from which you can charge your phone. This is within the park boundaries and in fact some night you will sleep to the distant sound of wild animals. It is a few meters from the top of the Murchison Falls. It has 26 thatched nice cottages each with its own sitting verandah. These are self contained and have running water both hot and cold, and the comfortable beds are each fitted with a mosquito net. They also offer room service, so you can always order in your breakfast. Additional lodge amenities include a stocked bar, a swimming pool, a restaurant and above all a well trained hospital team of staff.